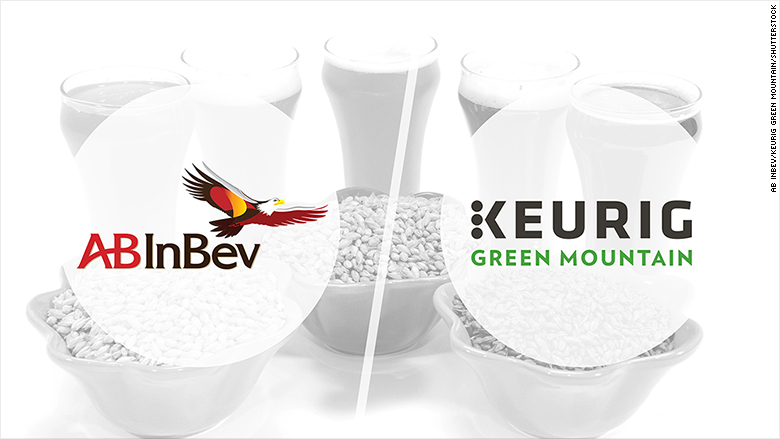 Keurig and Anheuser-Busch InBev (BUD) are teaming up to build an in-home booze brewer. The companies said Friday that they're launching a joint venture. The plan is to create an appliance that can churn out "beer, spirits, cocktails and mixers" at home, according to a press release. The companies are still researching the product, so there isn't even a prototype yet, much less any other details. But an Anheuser-Busch partnership may mean that it can create home-brewed versions of beers such as Budweiser and Corona. Keurig is best known for its single-cup coffee maker. But the new appliance will use the technology from its now-defunct cold beverage maker, the Keurig Kold, which was supposed to compete with SodaStream (SODA). Keurig desperately needs a hit product. It was acquired in 2015 for $13.9 billion by JAB Holding, which is privately held, after the company's stock price slid 70% in one year thanks to a massive sales slump. The Kold, Keurig's latest product launch, was a major flop. The company stopped making them in June last year after just 10 months of production, and even doled out refunds to customers who purchased the product, which retailed for a whopping $370. SodaStream also beat Keurig to the punch with making in-home beer brewers. The company began selling the SodaStream Beer Bar in a couple of European markets last May, and it's introducing the product to more countries throughout 2017.